Protect your wood from all pests, little hassle, proven effective! Provides long lasting protection against all wood-devouring insects, such as Wood Beetles, Termites, Ants and other wood destroying insects. Biodegradable, No odor, none staining and easily diluted with oil or water. Recommended for furniture, rattan, plywood, particleboard and other wood based products. 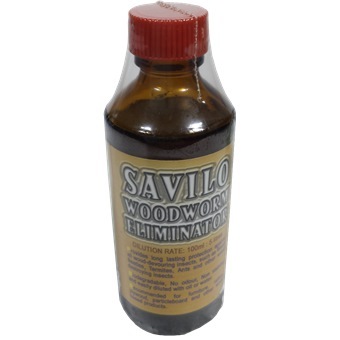 One bottle of the Woodworm Eliminator can be diluted to 5 litres of water, low aromatic kerosene, light oil or white spirit. It can be easily applied with a brush, sprayer or roller. For immovable furniture and objects, spraying the Eliminator into holes or edges in the furniture can most effectively protect them. The best one is the hole on top of the furniture, so that the liquid is allowed to flow gradually through the entire furniture to destroy the pests fully. Repeat treatment if necessary to maintain adequate control.